Solar-Vision Publishing/Softcover/2009/40 Pages!!! BRAND NEW!! There is no other cookbook quite like this!!! If anyone truly LOVES soul food cooking, BBQ'S, wants to learn new recipes, a fan of fast food chains that cater to creole or fried chicken tastes, OR a fan of the Louisiana style cooking----THIS IS THE COOKBOOK FOR YOU!!! 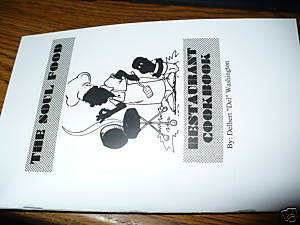 The author of this cookbook ran a small soul food restaurant in Los Angeles in the late 1970's. The very heart and soul of that restaurant lives on in these pages, for THESE are the actual recipes that he used, replicated here for home cooking in smaller batches for home kitchens! There are other soul food cookbooks out there, but this one delivers the dishes just like they were..
meatloaf, fried catfish, biscuits & gravy, mac & cheese, fried chicken, baked chicken, fried porkchop, seafood gumbo, DEL'S hamburgers, DEL'S special sauce, DEL'S hotdogs, DEL'S loose meat sandwiches, string beans, candied yams, mashed potatoes, sweet corn, fried cabbage, yellow rice, peach cobbler, heavy whipped topping you can use for pies, sweet potato pie, DEL'S pie crust recipe, banana pudding, banana cream pie, bread pudding, red jello parfait, green jello w/ fruit & whipped topping, ranch "hand" BB'Q sauce, "OLD SOUTH" BB'Q sauce, "DOWN-HOME" BB'Q sauce, black-eye peas, "ULTIMATE" fluffy rice, baked chicken "BONUS RECIPE" hush puppies, chitterlings, street vendor's corn on the cob, oven baked BB'Q ribs, BB'Q chicken sandwich, chicken fried steak, country gravy, "just like home" biscuits, skillet cornbread, easy rice pudding, "johnny cakes" (Cornbread Soul Food flapjacks).